If you are considering building or re-building using cob, you have two options. You can either use cob blocks or mass cob. We have previously discussed the benefits of using cob as a sustainable and ecological option for new builds and if you have an existing cob building this should always be repaired using cob. This is not only to maintain the integrity of the structure and its history, but also to keep your local Conservation Officer happy! Cob blocks are crafted from pre-mixed mass cob, formed into manageable sized building blocks, which are left to dry naturally until they are a strong, solid building material. Cob blocks can be purchased from specialist suppliers, such as J&J Sharpe in Devon, usually by the pallet. The quality of cob blocks can vary depending on the subsoil used and the craftsmanship of the producer. On occasion it can be difficult to get hold of cob blocks, due to the limited seasonal drying times in the UK and increases in demand. Generally, we would use cob blocks to repair existing cob walls. Defective cob can be cut out and removed in order to easily insert cob blocks. They would then be fixed into place using an earth mortar. Of course it is possible to build new walls using cob blocks, and this is certainly something we have done in the past. You will need to weigh up the availability of cob blocks and a mass cob source, as well as considering price and weather conditions when making your decision as to whether to use cob blocks or mass cob for your project. You may also see cob bricks being mentioned in your quest for more information on this topic. Cob bricks are smaller versions of cob blocks and may be used for smaller repairs. Mass cob can be dug out and mixed ‘by hand’ or with the use of a digger. The topsoil is dug out and removed. A pit is then dug to the required depth and the subsoil is set aside for mixing. Once the pit has been dug out, some of the subsoil is added back in and mixed with good quality wheat or barley straw and clean water. The materials are then thoroughly mixed together until they are fully integrated and consistent throughout. This process is continued until you have enough supply of mass cob and may be ongoing throughout a project. I prefer a dryer mix, although others may find a wetter mix preferable. Some people choose to combine the cob mix using their feet to tread in, but you can’t do this on a large scale and a digger can be used instead. Additional pits can be dug on site to supply your cob mixing pit. Coarse sand may be added to the mixture to give the mass cob more body and to help with drying if you have a mainly silt and clay subsoil. If your subsoil already contains a high proportion of aggregate, this may not be necessary. A cob pit can be located on site, which has advantages when it comes to cost and availability. We have recently been working on a site with a cob pit in Mid Devon – see the video below showing how the cob is mixed. There are advantages to building with both cob blocks and mass cob. See the table below for more information. A cob block wall is without doubt a strong structure, however, due to the nature of the blocks and the use of mortar joints, it is not as strong as a wall built from mass cob. Mass cob walls and buildings are known as mono-structures; there are no joins, which gives the building enormous strength and when maintained properly these structures have been recorded as lasting hundreds and thousands of years. Exterior mass cob walls tend to be built 600mm – 1000mm thick. It is not necessary to build the internal walls this thick, but they would still need to be larger than a regular brick wall. Mass cob can be transported from the cob pit, to the site of the building using trucks and trailers or if close by, wheelbarrows and by hand. The video below shows work taking place at one of our sites. Mass cob is being added layer by layer in ‘lifts’ of 600-900mm. You can see the stone plinth below which provides a stable base for the cob wall, but more importantly it limits water getting into the cob later on, which can cause damage and even collapse. 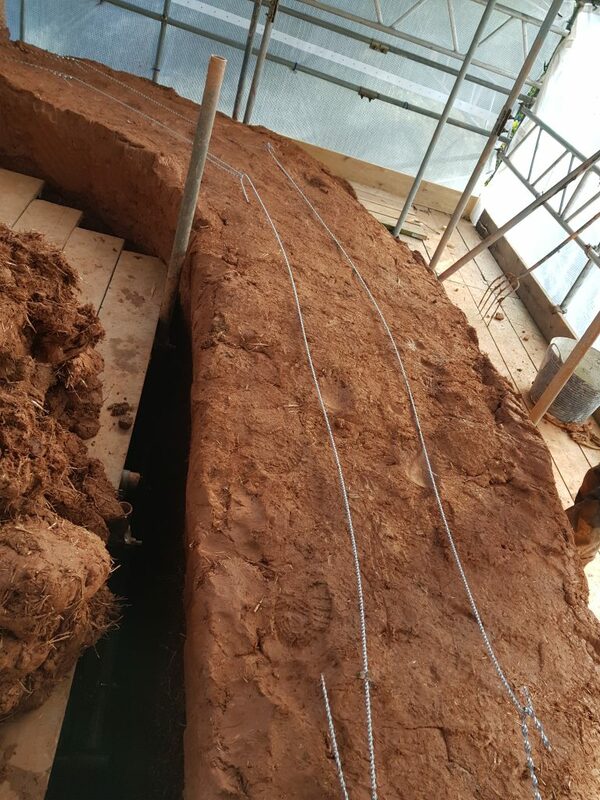 Mass cob under construction.Cob from our on-site cobpit being used to build thick external walls on this barn conversion project. It's hard work, but these walls should last a good few hundred years – maybe even a thousand! For more information about building with mass cob and examples of our projects, please see our Barn Conversion blog.